I thrive in the summer time. The summer sun and heat warms my soul and does wonders for my mental health. When August hits, however, I get a little sad. For me, it signals summer coming to a close. I know, I know – there are still a few more months of warm weather and sunny days ahead. With my son Jaxson heading back to school Aug. 15, it just further reiterates that fall is on the way. August is also my birth month (Aug. 23). It used to be a time for celebration – parties, beer etc. Now, each year when my birthday hits, it’s more a time of reflection and mostly depression as I think about what I’ve yet to accomplish as the years start to stack up. I did decide to change that mindset last year and had a great time with my family in Las Vegas. I’m hoping to have some sort of a similar distraction from my thoughts this year on my birthday. In this issue, read Carol Thompson’s story about Hallie Nolder, a Liberty High School junior who sings and plays her ukulele for senior residences around the area with her business – Fox and Cat Music. In our travel section, read about Salida and its art offerings. I also made my first visit to the El Paso County Fair a few weeks back. Turn to page 8 to see a handful of photos from my day at the fair. 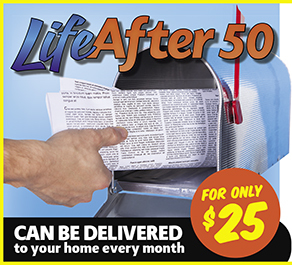 Thanks, as always, for reading Life After 50.